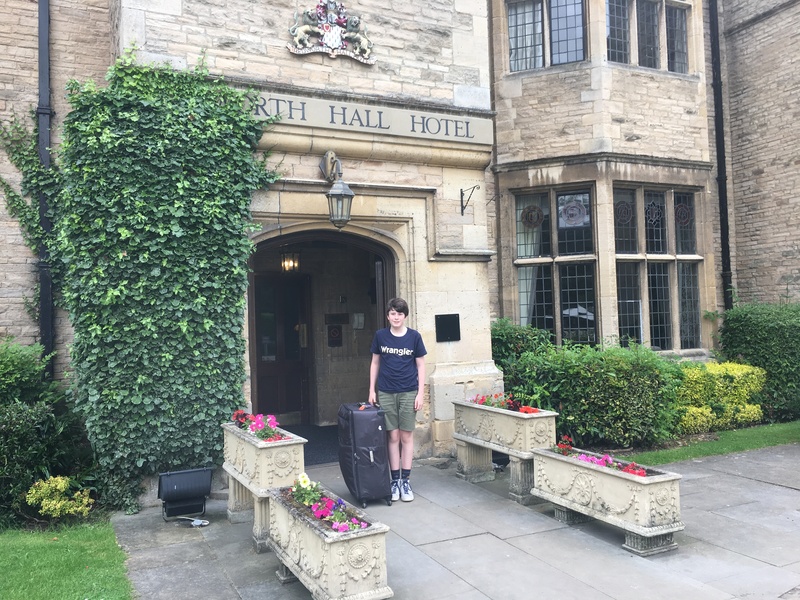 An hour’s drive from the waterfall and we arrived at our hotel for the next three nights – the Redworth Hall Hotel in Bishop Auckland, Co. Durham. I had stayed here years ago on one of my very first work trips. More familiar then with youth hostels and backpacker places, I remember being blown away by the luxury. When we realised this place would be convenient for all we wanted to see and do in Durham we booked it. It helped that it cost around the same as a Premier Inn but breakfast was included. I was excited to return. The approach to the hotel is magnificent with imposing gates, a very grand drive, landscaped gardens and lovely woodland. 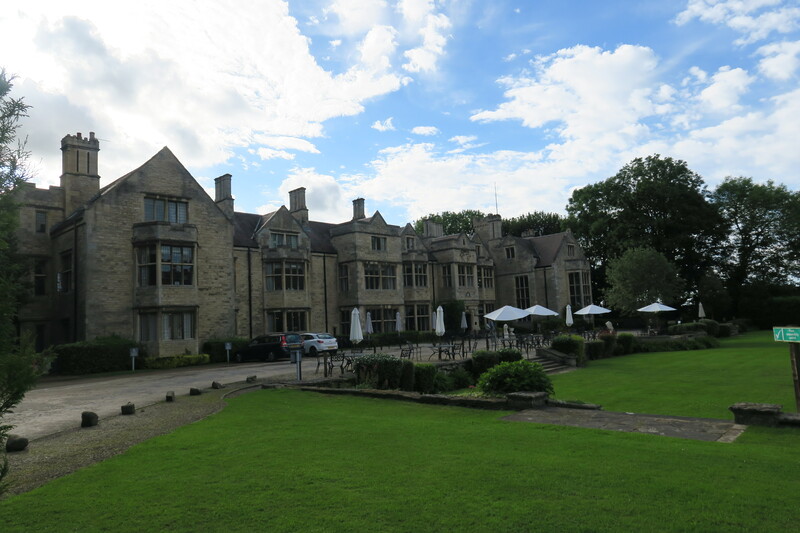 Once a 17th century Jacobean manor house, the main building is beautiful. 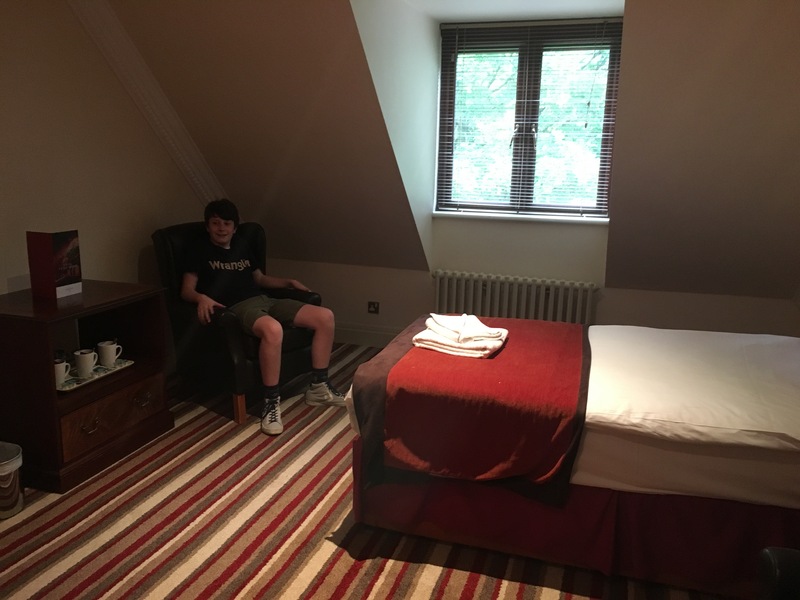 We checked-in, Son roamed around the lounge and reception area and gave it all a thumbs up. Our room was on the 4th floor, a family room it was very big and was actually two rooms linked by an archway. One room had a single bed, a couple of armchairs and a desk and minibar with tea and coffee making facilities. The other room had a double bed, television and huge wardrobe. 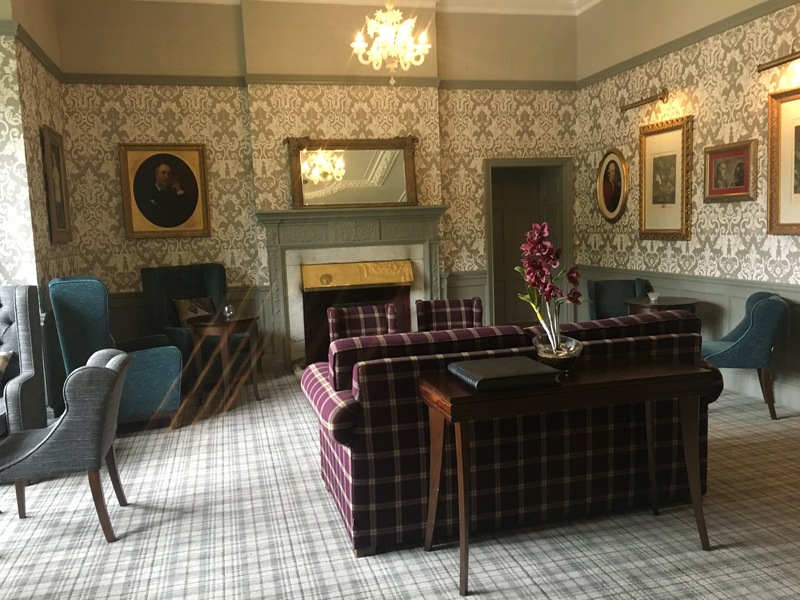 I liked the room, it felt clean and comfortable but was definitely showing a few signs of wear and tear. The room did feel quite dark even on a bright sunny day, we weren’t inside too much except at night so not a problem for us. The bathroom was clean, large and functional but again in need of a bit of TLC, it had a dated appearance and some areas were distinctly worn. The plumbing left something to be desired too – each time next door flushed their loo we “enjoyed” a rather loud and honking noise. Thankfully they didn’t need it much in the night…. The towels were far from fluffy too but overall I am being incredibly picky and we did love the space, comfort and size of the room. We had dinner in the restaurant on our first evening. A coach party (eek) was ahead of us, the whole place was bustling, we were mighty pleased to be shown through to a different area of the restaurant, much quieter with a table right by the window. Plenty of choice on the menu and three courses were available at a very reasonable price. Son enjoyed a mozzarella stuffed pork burger with delicious hand-cut chips. 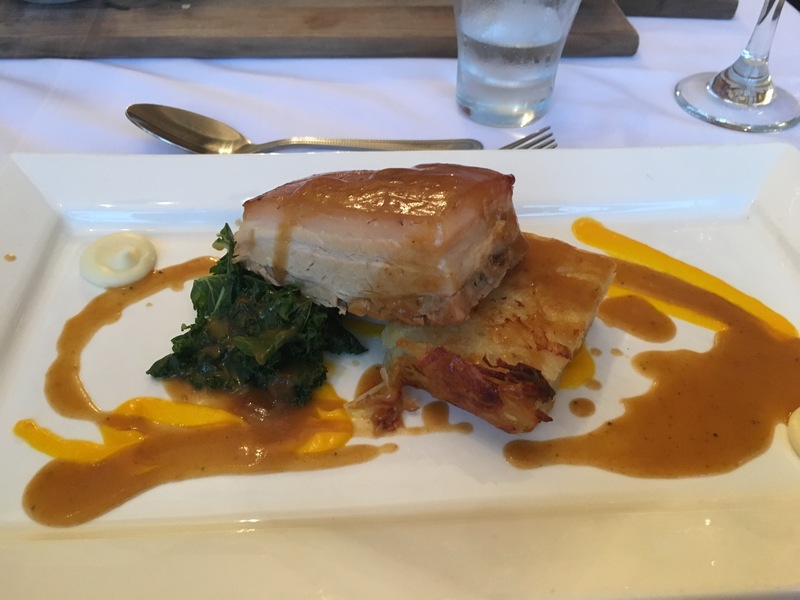 Husband and I both ordered pork belly with potato rosti and kale – nice but it didn’t blow us away and the speed of service left something to be desired. Breakfast was good, a reasonable amount of choice and Son, who loves nothing more than a hotel buffet was in his element. Much of his eating options involved bread, Nutella and chocolate in some form. I didn’t push the healthy options here. One of the best things about this hotel is the location. After dinner on our first evening we had a lovely walk in the grounds – there is so much to explore. 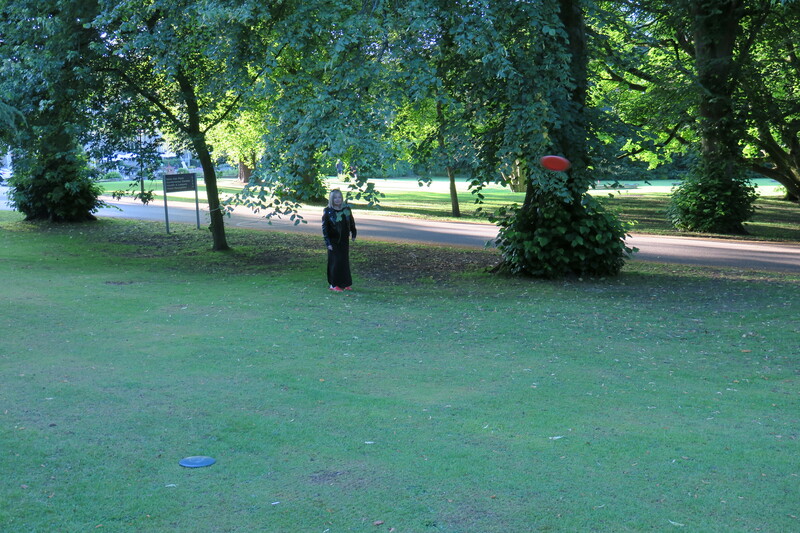 We checked out the swimming pool (never used it but it looked good) and played Frisbee Golf in the woodland area. Son collected the kit from the spa and we all had some fun with this. Some (me) were much worse than others. 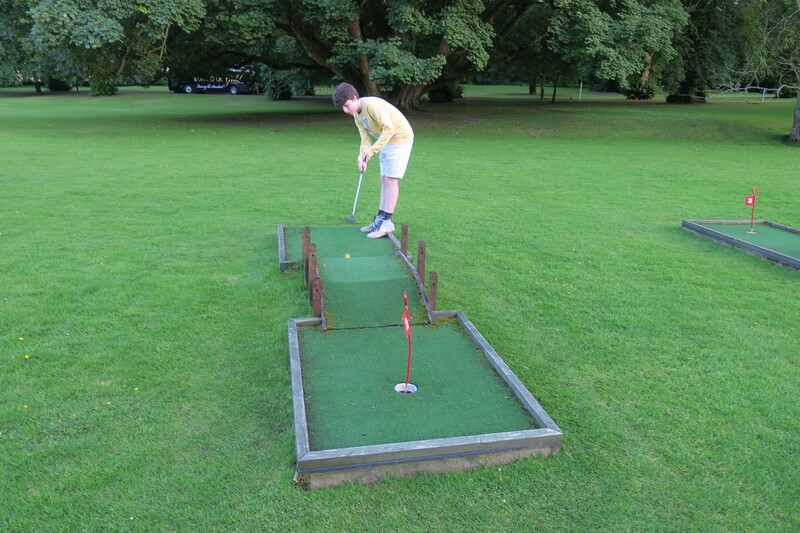 There is also a crazy golf course which we made use of on our last evening. Dinner on our second night was in the bar, as per Son’s request. He had spied someone eating a pizza and this was what he fancied. 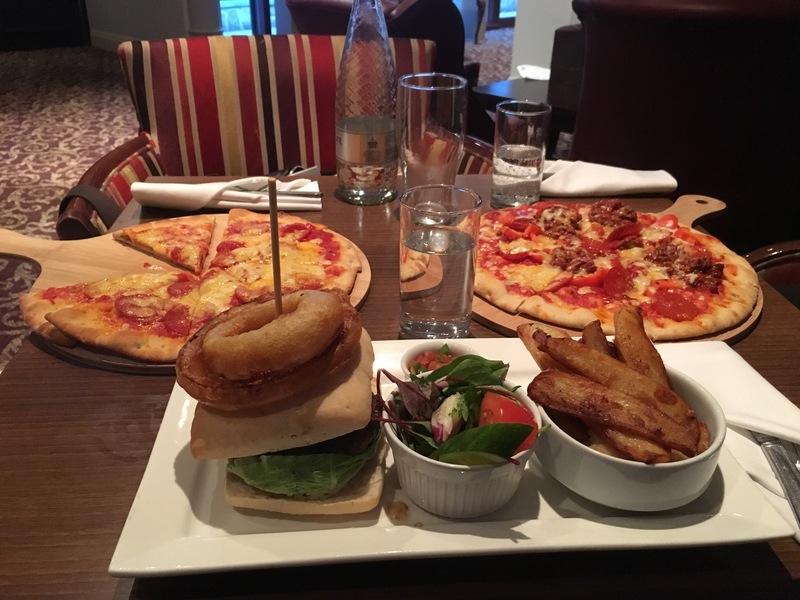 The food came reasonably quickly and we feasted on pizza and a burger – all very good. We went to the bar area each evening for half an hour or so. The mocktails there are very good plus it was a fun place to sit and take in all the hustle and bustle – there was plenty of that. All in all we enjoyed staying in this hotel. 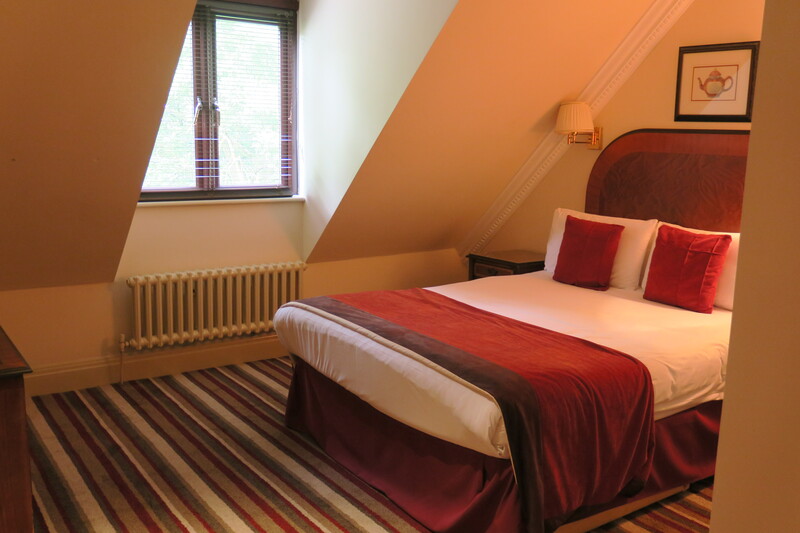 The rooms are nowhere near as luxurious as I remembered, show a bit of wear and tear and could do with a bit of an update. However, we were really comfortable, it was very clean, there was loads of space and we all slept like logs. The grounds and space outside were perfect for evening exploring and it is super convenient for visiting Durham and for the show Kynren (more about that in a later post). It ticked (most) of our boxes. The country house hotel looks very comfortable Joy and I like its extensive grounds. 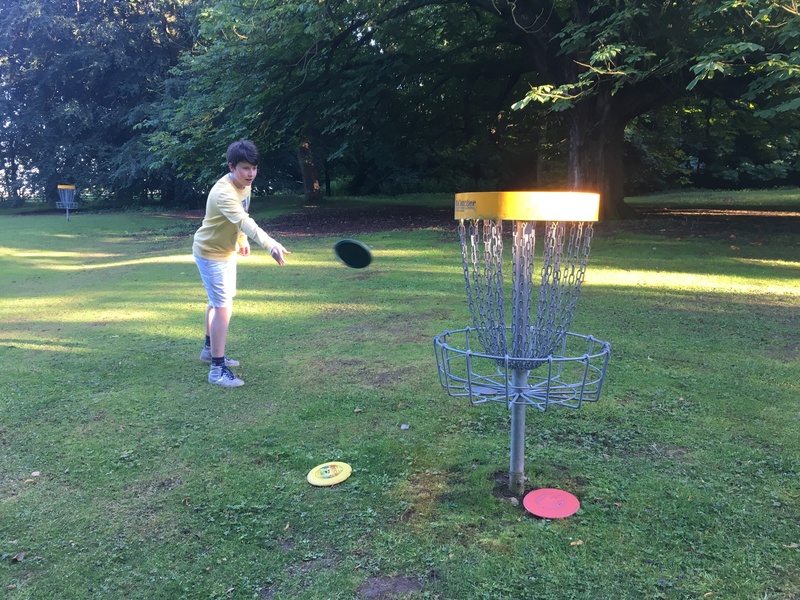 Frisbee Golf is popular in Finland and we have played it several times. 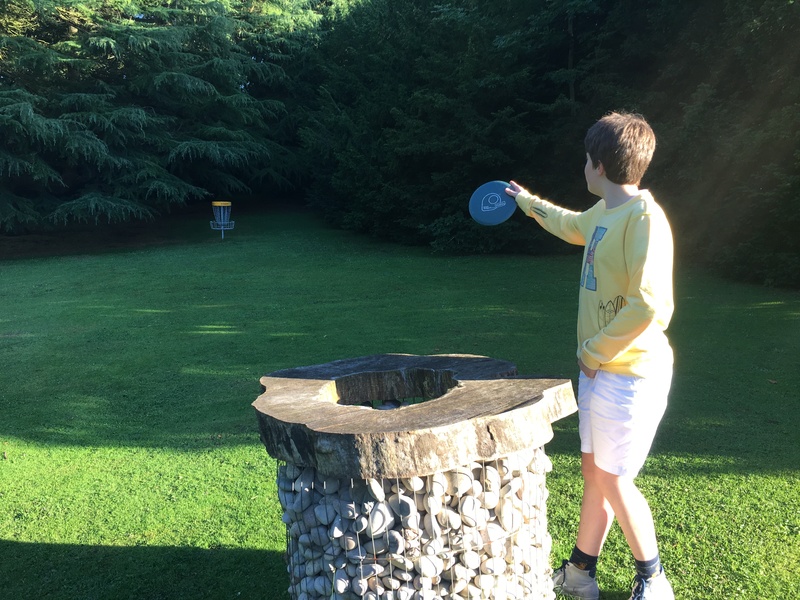 We bought a set of discs one year to take home but the only place I have noticed a course in the U.K. was in the Valley Gardens in Harrogate and, of course, the discs were at home! I’d like to visit Durham again sometime, I’ve been twice but not for many years, nowadays just whizzing past on the East Coast line to Edinburgh so I’ll look forward to reading your posts. Hope you are enjoying the Bank holiday, we are at home with quite nice weather! Marion. 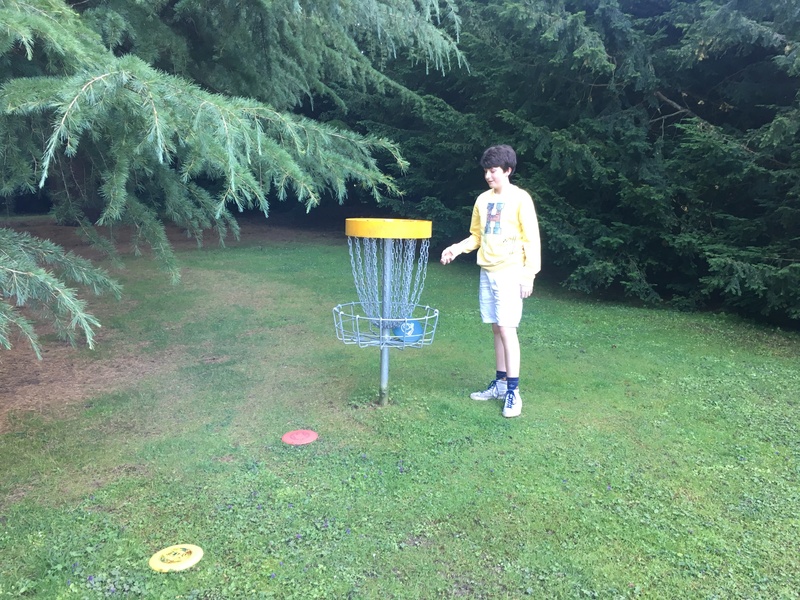 We loved the grounds here too Marion, so nice to explore after dinner and our son was a big fan of the frisbee golf. I liked it, just wasn’t much good!! We just got back yesterday from Devon, had lovely weather there and now sunshine for the Bank Holiday, so nice!! Hope your weekend goes well. I’ve never heard of frisbee golf. That looks like fun. Sometimes it just nice to stay somewhere other than a chain hotel, isn’t it? We tend to use accommodation for washing and sleeping so it just has to be clean and comfy. Anything else is a bonus. Things like hearing the plumbing from another room would drive me nuts though. We were just lucky the people next door didn’t need to flush in the night!!! For that I was grateful. The hotel was a nice change from the chains and the grounds were just gorgeous and lovely to stroll in after dinner. 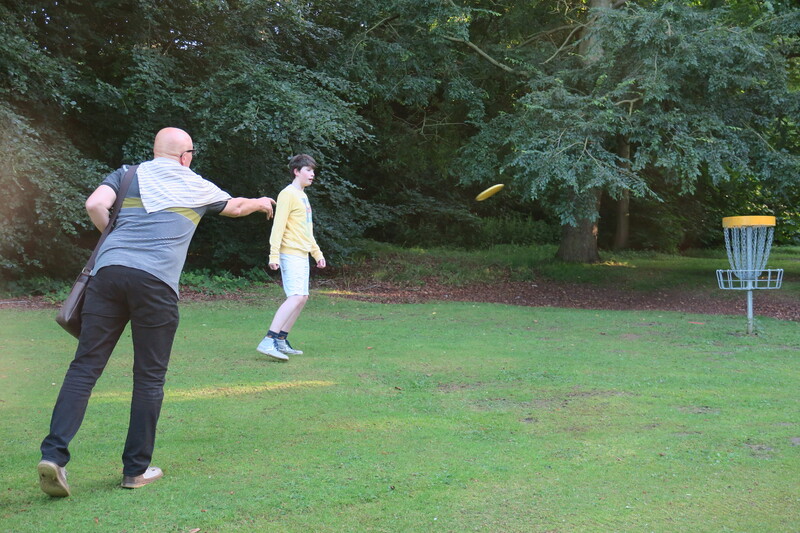 The frisbee golf helped with the strolling too – no moaning from our son!! The setting was just stunning. It was a nice place to stay despite the niggles Rosemary and as you say, a nice change to the Premier Inn for sure!! The grounds were just gorgeous and so nice to wander after dinner, the frisbee golf was a fun touch. Fluffy makes all the difference!! What s gorgeous place. The slanted ceiling might be an issue for me with my height but the rest of it, including the food, looks great. Yes those ceilings were a bit dodgy for my husband George – fine for me!! It was a good place, we loved the gorgeous gardens and grounds. 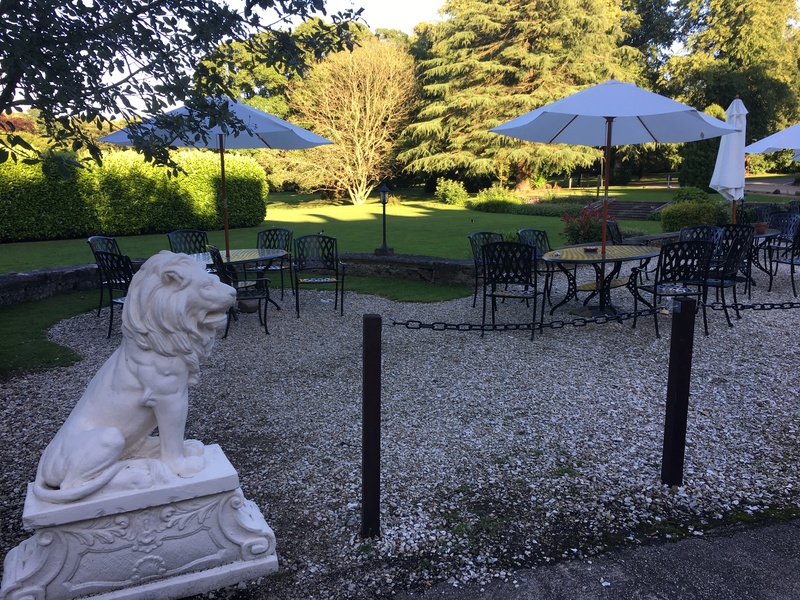 The grounds look beautiful even if the interiors were in need of an update! However, clean is a must and it met that requirement! Clean is the most important thing Pam, so true!! We did have a lovely stay though despite the little niggles. I had to lure my younger one to German language camp with me by promising him as much Kuchen (cake) as he could ask for in the target language. He got REALLY good at saying, “I’d like…” and “Please pass the…” and many nouns for sugar-laden carbohydrates. Ha ha – what a great idea to bring on his German though!!! I might try that with our son, he would soon master the essentials (chocolate etc..).